In the final two minutes of descent to the comet, a number of things needed to take place in rapid succession and perfectly. The failure of even a single one risked jeopardizing the entire mission, which was now well into its fifth year and which had cost American taxpayers a bit over four hundred million dollars. The fact that what taxpayers would be getting for their nearly half a billion dollars was a container of comet dust about the size of a shoebox made the demands of perfection for the landing all the more critical. With one hundred twenty seconds remaining, the lander detached itself from the main vehicle. It then fired a series of quick brief blasts from its maneuvering engines to reorient itself so that the main descent booster engine was facing the comet’s surface. For the duration of the landing, excavation, and ascent, the main vehicle would continue flying in formation with the comet, about one hundred meters above its surface. With twenty-five seconds remaining, the lander fired a series of brief bursts from engines atop the craft, so as to push the lander down toward the comet at a leisurely one meter per second. When the lander’s radar altimeter detected that the craft was just three meters from the irregular surface of the comet, a quick bit of image analysis verified that the chosen landing spot was sufficiently smooth to allow for a safe landing. Upon receiving this affirmative, the lander fired four harpoons at the surface, each connected to fine but strong cables attached to the lander. The comet was small and had only negligible gravitational attraction, so that this could not be counted upon to hold the lander securely to the surface for the duration of the excavation process. Instead, the lander would be held securely to the surface by the four harpoon cables. Once these had anchored themselves into the comet’s surface, small winches drew the lander down to the surface. When it came time to leave, the four cables would be severed by small explosive charges and the main lander engine would ignite for the two seconds required to provide enough velocity to make it back to the main mission vehicle. The harpoon cables were also important to the stabilization of the lander, since the digging tool would exert a great deal of pressure on the surface in order to make its way the expected twelve inches into the surface. Absent any means of securing the lander, the push of the drill would simply push the lander back into space. Throughout the landing sequence and the thirty or so minutes of excavation, a continuous series of high-resolution photographs was being taken for subsequent analysis. But the main point of the mission was the sample, obtained through the expedient of drilling into the soft composite surface of the comet with a two-inch-diameter auger and then collecting the extracted material with what amounted to a miniature backhoe that scooped up the material and deposited it into a receptacle in the lander whose lid was hermetically sealed to ensure that the precious materials wouldn’t be contaminated upon their return to earth. Once filled with comet materials and resealed, the container would not be opened again until it was safely ensconced within the quarantined environs of the Jet Propulsion Laboratory in California some four years from now. 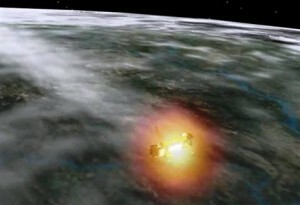 In the end, the mission went precisely as designed, and a cheer went up from the scientists and engineers at JPL and Houston Mission Control when the final confirmation came that the lander had separated from all four harpoon cables, ascended the hundred meters, and performed the complicated ballet of docking back with the main vehicle for the return trip to earth. It had been an engineering marvel, and all that remained now was for the craft to fire its engines to depart the comet and begin its long spiraling path back to earth. “Are you one hundred percent certain?” Scott Fulton, principal investigator on the CSRM-1 mission stared hard at the laptop screen before him. He was trying to make sense of the result that one of his materials scientists, Raj Patel, had just brought to him. The anomaly under discussion was tiny, but in the context of the precision with which NASA missions are managed, it was an anomaly that demanded an explanation—except that none was forthcoming, at least not yet. Patel listens to his boss (actually his boss’s boss’s boss) and nods in agreement. Both men know these details of the mission in immense detail. The SAC is the Storage and Analysis Container. Caesar is the informal name the mission team has adopted for the vehicle, derived from the first three initials of the more formal CSRM-1. A career with NASA is one of acronyms and arcane terminology. “No, sir. It is not nothing,” Patel responds. He only very rarely interacts with the mission’s head scientist and it is more than a little intimidating, particularly without his direct superior in the room and also without any apparent explanation for the anomaly. “Absolutely, sir,” Patel responded. “I’m on it, sir.” He accepted the laptop from Fulton’s outstretched hand and exited the room as quickly as he could without appearing to hurry. Nine years, four months, and seventeen days CSRM-1 had been away. Over nine years since the Comet Sample Return Mission had departed with a roar from Florida’s Cape Canaveral, only to be almost immediately forgotten by all but a handful of scientists working out of an underground lab at Cal Tech and a roomful of technicians at Houston’s Johnson Space Center. The comet Hadley-Kornikov had first appeared on astronomers’ telescopes just sixteen years ago, carving a trajectory which, while posing no threat to the inhabitants of earth, brought the six-mile-long aggregate of rock and ice to within just two million miles of the planet, so tantalizingly close and in such an unlikely but cooperative orbit that it immediately became a prime target for NASA’s first comet sample return mission. The optimal launch window for rendezvous had been tight, just ten months, and a quickly assembled team of contractors had designed and built the probe in record time. The launch had gone flawlessly and with little fanfare. The world had only awakened four and a half years later when the tiny probe had intercepted the comet, a feat described in numerous interviews by the auspiciously named program director Miles Kepler as not unlike shooting a high-powered bullet and hitting a second identical bullet over ten miles away. The world had been captivated for the forty-eight hours during which the spacecraft approached the comet, landed on its surface, and spent the next thirteen hours taking photos and collecting samples from the surface of the ancient object, a relic from the solar system’s original formation. The following day the probe had launched itself from the comet’s surface and begun the five-year journey home, again forgotten for the duration of the long return trip. But now it was home and less than one hour from its final challenging maneuver, reentering earth’s atmosphere and being snagged out of midair by a specially equipped Navy helicopter. The purity of the samples was the paramount concern of the mission team, and even though the recovered materials were safely ensconced within the body of the probe, no chances were being taken with a water or surface landing. Once it had endured the searing heat of a seventeen-thousand-mile-per-hour reentry, the heat shield would be ejected, a parachute deployed, and the tiny probe would be plucked out of mid air, and deposited into a sterile container inside the helicopter’s cargo compartment. The unopened probe would then be delivered to the Jet Propulsion Laboratory in Pasadena for what promised to be years of experimentation and analysis. At least that was the plan. “Descent angle nominal. Reentry velocity nominal. Altitude two eight zero thousand,” came the inflectionless voice of the flight controller. For the ensuing thirty seconds, chatter between the various control engineers in the Johnson Control Center was perfectly normal and professional. The probe fired its retrorockets precisely on schedule to orient itself correctly, then it streaked across the South Pacific, carving a path over Kwajalein and Kiribati Islands on its way to a rendezvous with a helicopter from the USS Essex about one hundred miles southwest of Tuvalu. 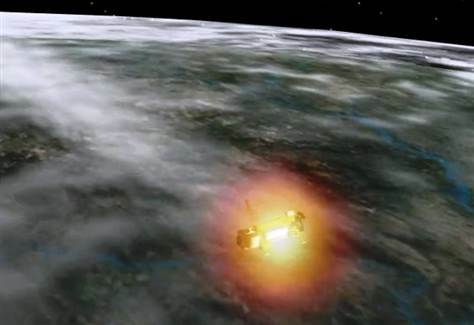 The probe left a half-mile trail of flame across the sky as its heat-ablating shield dissipated the immense energy of reentry and slowed the tiny probe to the point where its drogue and main parachutes could safely deploy. It was right around the time the supersonic drogue chute was deploying—intended to slow the craft from Mach 8 to subsonic—that the first sign of trouble appeared. At this point in the descent, the craft was in ballistic free fall with no planned firings of any of the probe’s six small control engines. At this point in the descent, with two control engines inadvertently battling against each other, the probe went into a series of increasingly severe oscillations that the probe’s structure was not designed to withstand. The probe was still at one hundred ten thousand feet high and traveling at Mach 8 when it began to come apart. The Marine helicopter crew, flying in a circular pattern twelve thousand feet above the carrier saw no recovery chutes, only a series of debris contrails far above and heading rapidly southeast. The carrier crew estimated that at its current speed and altitude, the probe—what remained of it—would likely end up in the Pacific someplace east of Fiji. But, in an unexpected bit of good fortune for the otherwise doomed mission, most of the significant portions of the destroyed probe ended up not in the ocean near Fiji, but actually on the Fijian island of Vanua Levu, about six miles northeast of Savusavu. Missing its intended landing spot by some seven hundred miles, the largest intact piece of the probe—charred and melted almost beyond recognition—impacted the ground at nearly Mach one, creating a sixteen-foot-deep crater and missing a small resort hotel on the island by just a hundred yards. It would be seven hours before the mission control engineers would receive news of the craft’s impact site.